When school is out, ETC is IN FULL SWING! FLASH SALE: $5 OFF Dec 29 Family Workshop. Register in advance and save! Use code “holiYAY”. Offer expires 4pm Fri Dec 28. This workshop is perfect for families who want to learn to fly together! Moms, dads, siblings, aunts, grandpas, and family friends are all welcome to attend! Learn new skills and games as an individual, a pair, and a group. Learn spotting techniques and gain confidence. Tuition is for each individual student, regardless of age. 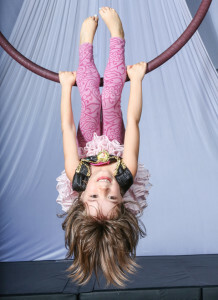 Explore creative movement, trapeze, acrobatics, silks, juggling, and more with your little one! Learn fabulous tricks on the mats and in the air…and most importantly, PLAY together! All children must bring an adult. Registration is per child. Swing! Tumble! Create! Perform! 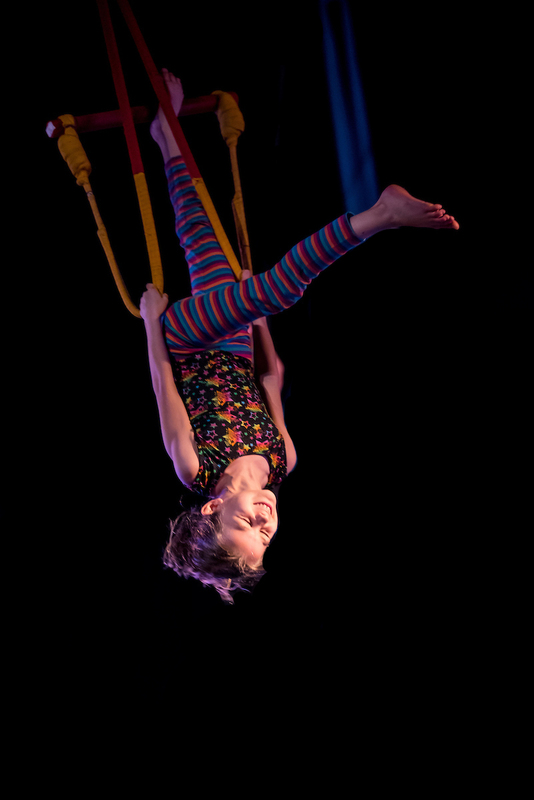 This 45 minute class is a playful introduction to trapeze, silks, acrobatics, and physical theater. Students build confidence, grace, and strength as they discover their own potential on the floor and in the air! Students build cooperative group skills as they learn partner tricks and explore physical theater exercises. There are no prerequisites for this class. Swing, tumble, create, and perform…MORE! This 85 min. class expands on our classic trapeze and acrobatics class, adding silks to the curriculum. Students build confidence, grace, and strength as they discover their own potential, and cooperative group skills as they learn partner tricks and explore physical theater exercises. 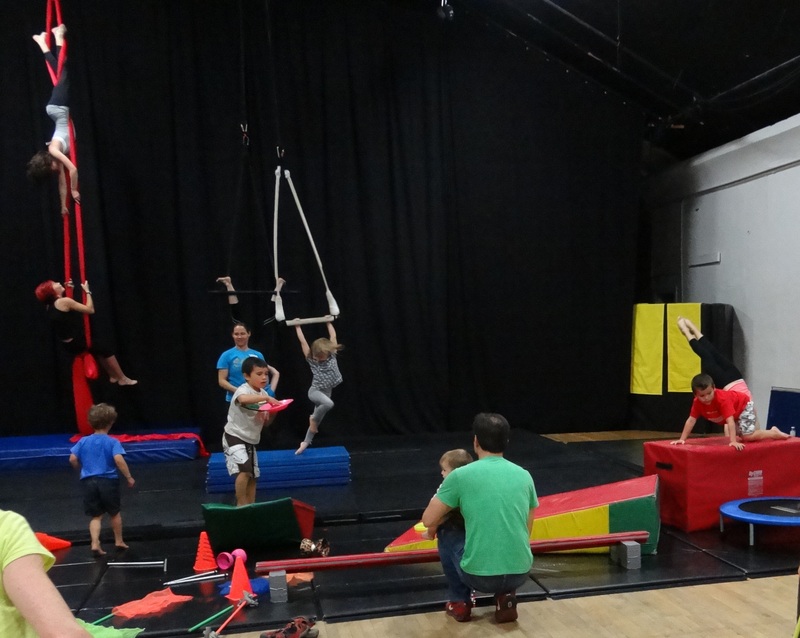 Level 1 focuses on single-point trapeze, silks, acrobatics, and physical theater. Levels 2+ offers more challenging skills and concepts and may include additional aerial apparatus. Instructor approval is required for level 2+. 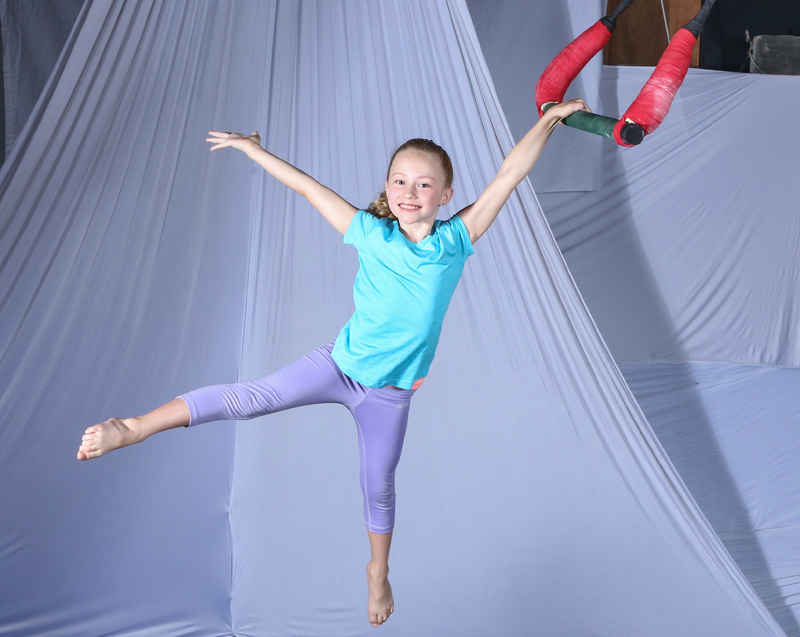 Explore silks, hoop (lyra), trapeze and invented apparatus in this class is for the student who just can’t spend enough time in the air! Students build strength, grace, and confidence as they learn new skills, create unique aerial vocabulary, and craft original pieces using story, dance, and their own imaginations! Level 1 open to all. Level 2+ students must have solid basics on trapeze, good core and upper body strength, and focused class-taking skills to attend. 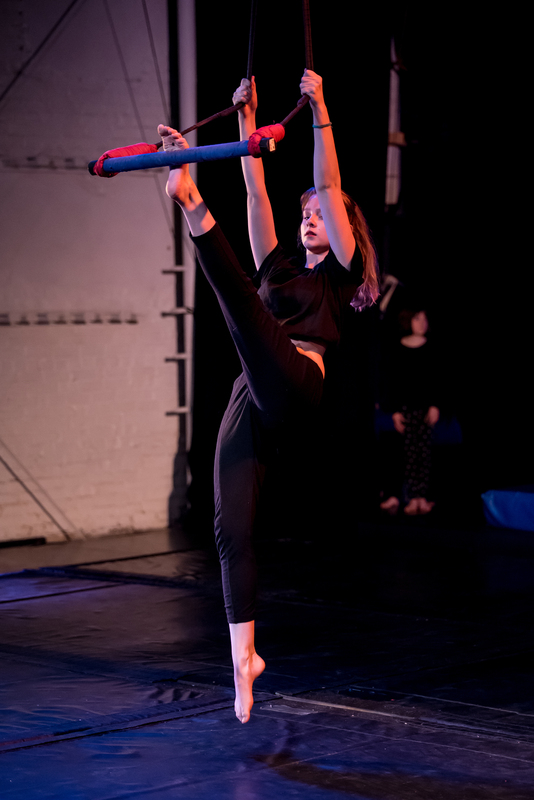 This class offers an overview of aerial dance for teens of all levels. 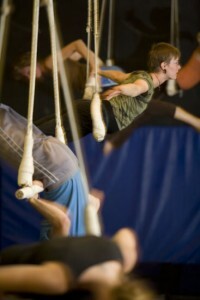 Learn vocabulary, improvisational techniques, and sequencing on a variety of aerial apparatus, including single-point trapeze, hoop, silks, and invented apparatus. Build core and upper body strength, confidence, and grace as you learn to fly! Students will be divided into age and skill appropriate groups within the class. Apparatus will vary depending on the interests and skill levels of the students. There are no prerequisites for this class. For currently enrolled or returning students only. Ages 4 – 9 must attend with an adult. Ages 10+ okay without an adult present. Please arrive on time, as we will begin with a led warm up and explanation of safety guidelines. Tuition is for each individual student, regardless of age. 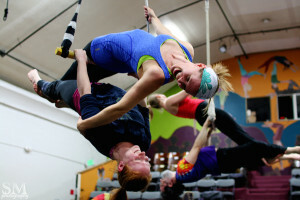 JUST ADDED: Wed Jan 2 Adult Open Gym & Thur Jan 3 Adult Mixed Aerial! 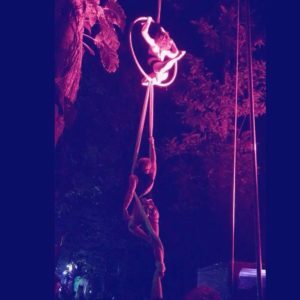 A body positive, playful, and engaging overview of aerial dance for all levels. Learn vocabulary on a variety of aerial apparatus, including single-point trapeze, hoop, silks, and invented apparatus. Build core and upper body strength, confidence, and grace as you learn to fly! Apparatus will depend on the interests and skill levels of the students. A body positive, playful, and engaging overview of aerial arts and acrobatics for the beginning or intermediate student. Learn fundamental v ocabulary on the floor and in the air! Build core and upper body strength, confidence, and grace as you learn to fly! Apparatus will vary depending on the interests and skill levels of the students. There are no prerequisites for this class. Looking for a play ful way to get your body grooving/ your heart pumping/your coordination and confidence growing? 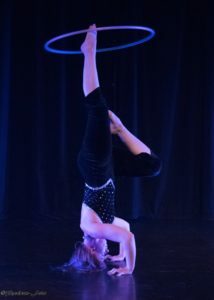 Then this hooping workshop is for you! Build strength & flexibility for acrobatics, aerial work & life! Emphasizes whole body integration, range of motion, & alignment. All levels welcome. Full term or drop-in.